Check out some important intraday trading indicators that will help intraday traders to take long & short position in market at Indiainfoline.com. Intraday trading indicators are signals that technical charts give out for intraday traders to take long or short positions in the market. The beauty of intraday trading indicators is that they not only cover price but they also cover finer aspects such as volumes, volatility, momentum, and price acceleration. Let us look at some key intraday trading indicators that intraday traders can use to trade profitably in the markets. When you interpret any intraday trading signal, the first thing you need to ask is whether the signal is real or false. Once it is clear that the signal is genuine, the next step is to check for volume confirmation, and once that is done, you need to check for the momentum. Here is how to go about interpreting intraday trading indicators. The most basic technique is analyzing supports and resistances. These are no indicators but very useful to initiate trades and set stop losses. You can also trade bounce-ups, bounce-backs, and in trading break-outs. The simplest indicators for traders are the 50-DMA, 100-DMA, and 200-DMA. DMA refers to daily moving averages for a time series and this can be further fine-tuned using exponential moving averages. Traders take trading clues when the price line cuts above or below the DMA line. As stated earlier, it is not just the direction of the trend but also the strength of the trend which adds credibility. This can be measured using the Relative strength index (RSI), which varies between 0 and 100. Normally, 30 is an RSI buy signal and 70 is an RSI sell signal. Traders take larger positions in intraday when there is a visible shift in momentum. This is when higher returns can be realized with slightly higher risk. Oscillators range between 0 and 100 and underline the intensity of momentum. They are useful for trading stocks showing trends that diverge from the market. How to apply these indicators to intraday trading? 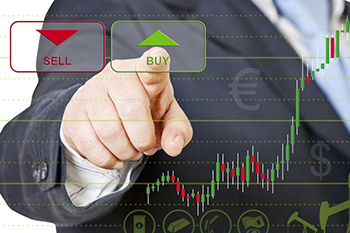 Intraday traders use indicators to maximize returns and minimize risk.